The economy class in an airplane is called steerage even though passengers do not have to steer the jumbo jet. That’s because earlier the lowest deck on a ship was the cheapest. It was called steerage because it was located above the steerage gear. These days you may not board a boat for years, but chances are you use nautical terminology every day. When you say that someone is “adrift” or “unmoored”, when you are “taken aback”, when you find someone is “under the weather” -- in all cases, you are invoking nautical lingo. This week we’ll see five terms of nautical origins, now used metaphorically. Enough talking! All aboard! Let’s get under way. adjective: Reliable, genuine, or trustworthy. 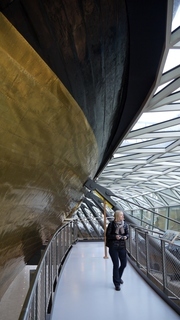 From the practice of covering a ship’s hull with copper (or alloy) to protect it from salt water and marine organisms. Earliest documented use: 1795. Don’t confuse this term with copperplate. Alex Massie; Breaking News: There Are Such Things as Facts; The Times (London, UK); Feb 22, 2017. See more usage examples of copper-bottomed in Vocabulary.com’s dictionary.